Monday morning is always a challenge to get up early. The kids will always say... "still sleepy Mommy" ... but too bad they have to get up after the alarm clock rang at 6AM. We had a bad traffic jam this morning from home but luckily that my house isn't too far from the toll gate, so we made it around 20 minutes to school. And it took me about 30 minutes on the way back home. Sleepy bento is the theme for today's bento. Hope kids will not fall asleep in the class :D I bought the tiny jelly balls at the supermarket yesterday, perfect for the nose. Inside the box : 'sleepy' rice balls (seasoned with light soy sauce), pan fried tempeh, chicken honey mustard (leftover from dinner), sauteed brussel sprouts and chicken ham, and grape tomatoes. So happy that this month I got the BOMB (Back to School theme). Thanks for Debra to arrange this fun event, BOMB every month for us to participate! 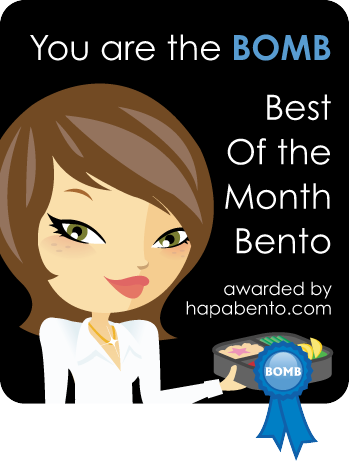 Stay tuned on her blog, Hapa Bento for the next BOMB theme. @Indonesia Eats : You are quick today! Thanks a lot Pep! @sherimiya : hahaha ... Can't wait to see your sleepy bento tomorrow, I know will be the great one :) Thanks a lot Sheri! we need to get up 6am every morning too and leave by 7am..
think my bento should be sleepy bento everyday....yea..
Those sleepy-heads look just like me. I'm always wanting to take a nap. Their expressions are perfect. 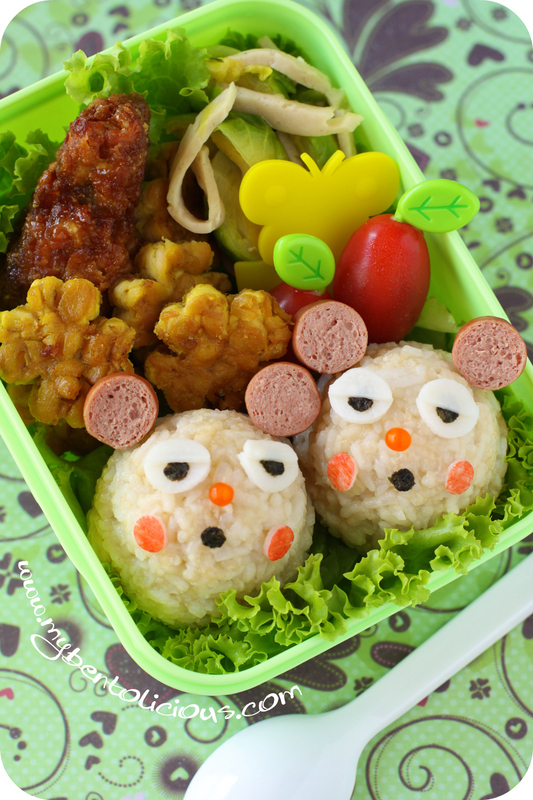 yawn.it's a rainy afternoon here now and your bento sure depicts my eyes now! haha..I love tempeh too especially fried with chilli, anchovies and nuts! Congratulations, Lia on your BOMB this month. @emilynpf : Thanks a lot Emily! OMG they are so adorable! Love the expressions..lol Crack me up! Congrats on the Best of the Month award!! Very well deserved. Oh those sleepy bentos.. that was me this morning. lol. Hope your kids had a great school day, and you as well! @Chantale : Thanks a lot Chantale! HAHA!! Their drowsy looks cracked me up, thanks Lia! Every morning, my kid and I just have a drowsy look like that. I sure will remember the cute and funny face every morning so that I can stay wide awake lol! @babykins : Thanks a lot Izumi for your sweet comment! I have to go through the same thing too every morning. My son can't wake up but he always refused to sleep early at night. What cute little sleepy bears! Love the little red nose on them! My boy is like Angeleyes's son, refuse to sleep early (-_-). @Vanessa : Perhaps your boy still taking a nap? Sometimes that makes them can't sleep earlier during the night time. Thanks a lot Vanessa for your comment! haha these mice/bears DO look sleepy, so cute! what are the jelly ball noses? i've never seen that in my market - are they sweet, or savory (maybe tomato or chili with gelatin)? this is what i look like when i wake up in the morning!